Having mentioned my Dan Dare Radio Station earlier I thought that might be as good a place as any to start with my look at some of the older toys around. DanDare, probably the original British science fiction comic hero was the creation of illustrator Frank Hampson and appeared in the boys Eagle comic in the 1950′s. Dan Dare was the chief pilot of the Interplanet Space Fleet and typical of the heroes of that era was bound by a sense of honour, never lied and would rather die than break his word …. in other words an all round good egg ! Together with Digby his stout (in more senses than one) batman they constantly battled with The Mekon in his attempt to conquer the Earth. Dan Dare not only starred in the Eagle but could be heard Mon. – Fri. 7.15 -7.30pm on Radio Luxembourg for 5 years from 1951 sponsored by Horlicks. Indeed I can just about remember sat listening on the settee, mug of Horlicks in one hand and a malted milk biscuit in the other before ‘Saceships Away’ and zooming upstairs to bed. What simple lives we led then ! … I still do the same today but there’s no Dan Dare and I don’t do zoom anymore !! Although Dan Dare continues in his various guises right up to today it is from those early days that his toys are most sought after. So now we have the background to the Dan Dare story lets look at some of the toys in more detail. But first, just an observation – a small point but worthy of note that Dan Dare merchandise, in particular items by Randall/Merit came in boxes with superb colour graphics. Graphics which took you from planet Earth to the far reaches of deep space in an instant, graphics which, in my opinion, were only matched later by Airfix ! Officially licensed product from J & L Randall. 2 way walkie-talkie set comprised : 2 plastic red and black hand units with green, yellow and blue press buttons, retractable aerial and length of connecting wire with end connectors. Made in England by Merit. A hard to find item complete and boxed. 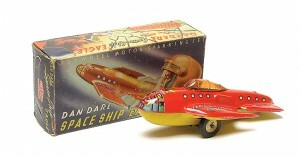 Officially licensed product this red, yellow and blue printed tinplate spaceship with plastic canopy had a friction drive motor. Made in Gt. Britain by Mettoy. Relatively hard to find model especially complete and boxed. A fully licensed product by the ‘Eagle’ comic this particular 150 piece Jig-saw was produced under the ‘Peter Pan’ games label and entitled ‘Dan Dare repels the Venutians’. 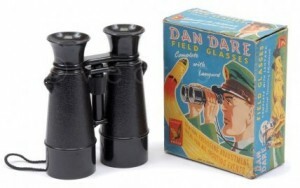 Dan Dare field glasses made in England in the 1950′s. Black plastic, Dan Dare embossed to both external lens casings, complete with lanyard. Licensed by the Eagle Comic, 25cm. x 15cm. 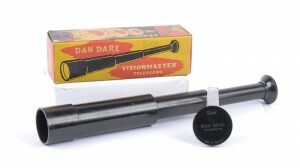 Dan Dare Visionmaster telescope manufactured in England by Selcol. Black plastic with Dan Dare printed lens cap, 3x magnification, extends to 12″. Fully licensed product by the Eagle Comic. 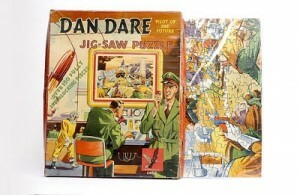 For further images of Dan Dare toys please see my other Dan Dare posts. It the walkie-talkie set available? Hi there Neil and thanks for your interest but sorry to say no D/D walkie-talkie in stock at present. These items go out as fast as I can source them but happy to keep your details and get back to you as and when I get another set in. To add a little to my earlier notes the Dan Dare radio show was aired on Radio Luxembourg in the 1950′s although the series was actually produced in London at the Star Sound Recording Studios onto wax discs which were then sent to Radio Luxembourg for broadcasting. As you know the show was sponsored by Horlicks who invited children to enroll in the ‘Horlicks Spacemen’s Club’. As a member you could purchase various Dan Dare related merchandise for a small fee, usually 6d – 2 1/2p in todays money – together with a label from a jar of Horlicks. Dan Dare items available were : cap badge, periscope, tie, spacship, handbook and your space cup ! Yes I’m getting there – Value of your cup, depending on condition, around the £60 – £80 mark. Hope that answers your question and thanks for visiting the site – David. I HAVE BEEN LOOKING AROUND FOR SOME INFO ON THE,MERIT TWO WAY WALKIE TALKIES. I HAVE A SET COMPLETE AND WITH ORIGINAL BOX.CAN YOU TELL ME AN APPROX.AGE AND WHAT THEY ARE WORTH AT THE MOMENT?THE WIRE HAS BEEN TAKEN OUT AND PUT BACK IN BUT ITS COMPLETE. OK Art as far as I know Merit actually produced 3 different walkie-talkie sets all dating to the 1950′s. One was the official Dan DARE set which is shown in an earlier post and to save anyone asking would sell for around £60-£80. They also produced a set which is far easier to find and shows a picture of the moon on the box lid, the handsets of this set looking more like the ones actually in use on planet Earth at the time rather than the more futuristic Dan Dare type, price for this set between £15-£35. Lastly they produced a ‘Space Patrol’ walkie-talkie set, same basic type hard plastic handsets but in a much more colourful box with a child like astronaut pictured on its lift-up lid. This is a harder to find set and would sell for between £40-£60. Prices given are based on average UK auction prices 2010 as far as I can find and will vary considerably dependent on condition both of the box and its contents. The retail prices asked would obviously be much higher than those achieved at auction. I’ve got an Eagle Paintbox, in its original box. It has hardly been used. Do you know if it has any value? Gosh Derek to be honest I’ve not come across this piece of ‘Eagle’ merchandise before. I know all my paint boxes got used pretty quick when I was a lad in the mid-late ’50′s especially the Crimson Lake block ! painting the town red even then !! Guess thats why not many survive in anything like a complete condition. I do know that there was a Big Eagle paint box produced in the 1950′s, this had a retail price of 7/6d and contained something like 48 paints, but that had nothing to do with the Eagle comic. Sorry I am unable to give you a definitive price on your item, if I was being clever I could say its a case of its worth what someone will pay for it ! but thats not much good to you. However as its not featuring a character from the comic then its value is in the relatively low pounds bracket .. but if anyone can add anything more to this I’ll be glad to hear from them. Cheers and thanks for dropping in, David. Hi, I have an SS Eagle tin toy lioke the one on your website. Unfortunately it doesn’t have a box, I’ve had it since I was about 4yrs old, I’m nearing 60 now and just wondered what it might be worth, can you help? Hi Brian, the Dan Dare – Earth, Mars, Venus Express otherwise known as the SS Eagle and its value ? Its a difficult thing to quantify without any pics and without a box will seriously lower its worth. As with all vintage toys condition is all ; the friction motor must be in good order, paint work especially on this model with its detailed lithography must be in super condition, tyres too but most important of all it has to have its original canopy. Having said all that I managed to pick one up in very good order earlier this year for around the £60.00 mark ! but I have seen them go for more and don’t forget all prices have taken a big dip this year, with a box you would be up around the £100 mark. If and when the market picks up I would estimate your model in good order but without a box should be somewhere around the £80 mark. Will e-mail you further on this – David. Thanks for visiting the site Storm and for your request for an idea on value of your Dan Dare merchandise – Sounds like youv’e got some nice items there ! – as I’ve said in an earlier response when it comes to value its a case of condition – condition – condition, both of the item and its corresponding box. As before without seeing the pieces in question I am only able to offer a guide based primarily on current auction values and the state of the market so will e-mail you with this info etc. shortly. – David. hi, could you tell me what the value of a dan dare lead modal is worth and also the badge that cam with the horlicks mug?? Thanks for dropping in Jay – sorry but can’t give you a price for your Dan Dare merchandise in so much that your figure may well be a modern replica rather than an original figure made by Crescent, also prices vary from figure to figure anything between £15 – £30 may be realised. Your plastic Horlicks badge however if genuine may well fetch upto £100+ in mint condition. Prices are based on auction estimates and there would be commission to take off these figures. Planet Earth calling Australia … Planet Earth calling Australia … not sure if this walkie talkie set stretches that far ? Well Noelene if you’ve had your set since the mid 50′s its a pretty safe bet to be original. The repro boxes are a relatively recent introduction as the items they housed became more and more sought after and thus more and more valuable … and even more so if they came in a box .. hence it became worthwhile to go to the expense of making a reproduction of the original box. (Hope you can follow me so far !) Also I have come across both boxes with and without the catalogue number, the boxes without being the earlier ones in my opinion. Similarly the Merit Dan Dare Radio Station also has a box with and without a catalogue number printed although there are other differences to this box but again both are genuine. Connecting took us both a while David, but now we have been able to “speak” to each other. Thank you for your information. At least if I ever decide to sell I can have confidence that I don’t have a reproduction set. No probs, glad I could be of some help. Hope you will keep dropping in for a browse. Hi there Karen, sorry to say I don’t know anyone who specialises in repairs to this particular item …. You say it doesn’t work but without being specific so lets assume its just the ‘electrical’ items ie the searchlight or the morse code buzzer. As the station is battery powered I would suggest you have a word with a good old fashioned electrician who should be able to resolve those particular elements without too much effort and should also be able to attend to the walkie-talkies if you have a problem with those pieces. Personally I always try to find a retired electrician/clock repairer/engineer who usually has both the time and the interest in attempting to bring an old toy back to life rather than just being interested in quoting an hourly rate ! You will probably need to spend some time locating this chap – try the local pub, ask the landlord in a loud voice for a bit of help .. if he doesn’t know anyone, someone at the bar may well do. It worked for me once when I needed someone to fix a old clockwork motor ! Sorry I can’t be of any more assistance, but if anyone can help further drop me a line and I will put you in touch with Karen. Many thanks for your help. Any excuse for a trip to the local! No probs Karen, sorry I couldn’t be of any further help on this. Best of luck, let me know how you get on – by the way mine’s a pint ! Dear Dave, I am so pleased to have found your site. I was fortunate enough to find a Dan Dare Radio Station this week and it looks as if it’s owner never played with it- very sad for him but fortunate for me! I’ve made a guess as to which batteries are needed but apparently I’m wrong! Any idea which ones would enable me to ‘receive voice and code up to half a mile’. …. Thank you. Greetings Earthling, the batteries needed to power up the radio station were 2 x U2 type which I think were later called HP2 but are now classed as type D ? However don’t build up your hopes and send someone to a galaxy far, far away, or even as far as the walkie-talkie wires stretch and expect any decent results. Sure the searchlight illuminates and the morse key will work but I think the wording on the box would not meet todays advertising code of practice ! Lets be honest the wires didn’t stretch to half a mile to start with .. But don’t lets forget it was a toy and in my childhood to go in the next room and hear a voice coming over the ‘wires’ was brill ! .. and yes I probably thought it was miles away .. it was called IMAGINATION !! Ground Control signing off, hope that answers your question Rona, David. I have 2 copies of the original Presso Dan Dare Spaceship Model Books designed by Wallis Rigby. Both are complete and in virtually mint condition. I believe these are quite rare (the Anastasia apparently being the more common one) and wondered if you had any idea of their value. Ground control to Mike, as you will know from many of my replies I am not keen on valuations … too many variables … but putting those aside for a minute I will try to give you some idea with the following thoughts. Some ten years or so ago these Presso books could fetch three figures (£100 – £120) but as we all know times have changed. Come forward in time and say four years ago or so and the value at auction was down to around the £40 mark ! The last one I saw sold at auction was in 2010 and in good/excellent condition it sold for around £35 including buyers premium. You may have seen one was recently listed on Ebay at £120 but did not attract a bid. A word of warning the Space Cadets out there, this is one Dan Dare item that should carry an Interplanet Space Fleet warning. Modern photocopying/binding techniques mean there are many reproductions out there .. good ones at that .. the only difference being the models are not pre-punched so as to press out but would need to be cut out !! so check carefully before you buy. Might not be the answer you are looking for Mike but no doubt you will be aware all markets are flat lining at the minute .. if you are selling at auction etc best put a reserve on it. Sorting out stuff for a ‘memory box ‘ for our son’s 40th came across his Dan Dare cap . This is blue with a silver peak, raised picture of DD , a hologram and the words ‘Dan dare’ in red capitals. As we have not seen reference to this on line does it have value….before we pass it on for his own two sons to play with? Thanks , G K.
Graham it could be a case of Good News / Bad News with your Dan Dare cap ! To be honest its not an item you see very often and I’ve certainly not come across one at any toy auction I’ve been to. The cap was an official Dan Dare item of children’s clothing issued in 1991 and manufactured under the ‘Ladybird’ label. As to price/value – no idea, however as Dan Dare merchandise is well sought after I would think it may well be worthwhile trying it on that well known internet auction site rather than consigning it to the random plaything of your two grandchildren ! Let us know how you get on !! 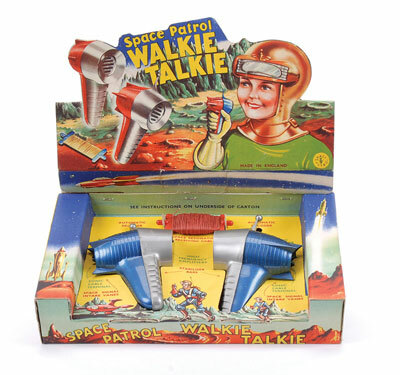 I have a dan dare space patrol walkie talkie set in original condition and original packaging from 1955 just wondering what kind of value I’d be looking at? Merit #3100 Dan Dare Walkie-Talkie set value ? As usual it depends on condition, condition, condition ! but the current value seems to be around the £30.00 – £50.00 mark. That seems to be the prices being achieved both at recent toy auctions I’ve attended and is also backed up by completed listings I’ve come across on internet sales sites. Typically these prices are well down on previous years. As usual there are exceptions to these but generally you are looking at an average value of £40.00 for a set in good condition in a good box. Does anyone have a photo of a boxed Dan Dare Rocket builder showing how the pieces are positioned on the yellow mounting card. Sorry Lloyd but I for one can’t help you on this one but if anyone else can help out then please get in touch. Dan Dare Pilot of the Future .. toys continued rodgersantiques – open for business !